All signs suggest Troika simply needed more time. Bloodlines was made in a hurry, with the team working in almost constant crunch mode just to get the game out of the door. The developers used a prototype of Valve's Source engine that was still under construction, forcing Troika to write its own code to fill in the gaps. Because of this, Bloodlines was riddled with bugs on release. Some were trivial, like animation and graphical glitches. Others were more severe, like bugs that dumped you out of the game or made it impossible to proceed. When it was released, Bloodlines was still very much a work in progress, and everything from the blocky level design to the wildly varying quality of character models to the plethora of bugs marked a game that simply was not yet ready for prime time. Troika's Jason Anderson, who served as the game's Creative Director, among other things, laid the blame squarely on publisher Activision, saying that Activision took the game out of Troika's hands without ever giving them the time to test and polish it. It's true that Activision had a timetable for the game - they even advanced Troika more money so it could finish Temple of Elemental Evil for Atari more quickly and put the whole team on Bloodlines. But Troika has to take some share of the blame for trying to build a complex RPG with too small a team using a brand-new technology. Sadly, Bloodlines was the last game that Troika would ever make, as the company folded just a few months after its release. 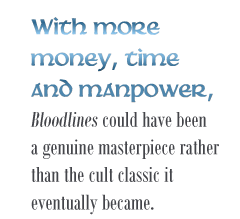 With more money, time and manpower, Bloodlines could have been a genuine masterpiece rather than the cult classic it eventually became. But even though it stumbled out of the starting gate, Bloodlines accomplished something great: More than five years on, there is still a dedicated community creating unofficial patches and restoring cut content, a feat that few games - even incredibly popular and well known ones - can boast. Great games may inspire awe, but Troika's swan song stirred a feeling in players that is just as powerful: devotion. Logan Westbrook is a news room contributor for The Escapist. Occasionally he updates his blog at http://www.verbscience.com.